Mud Sundae – Coffee Ice Cream topped with crushed Oreos, Hot Fudge & Whipped Cream. Reese’s Fudge Sundae – Vanilla Ice Cream smothered in Hot Fudge, Reese’s Peanut Butter Cups, with Whipped Cream. Fudgernutter – What a Combo! Vanilla Ice Cream, Peanut Butter Sauce, Hot Fudge, Marshmallow, Whipped Cream & Peanuts. Chocolate Coconut Almond Sundae – Chocolate Ice Cream Topped with Coconut Sauce, Chocolate Covered Almonds, & Whipped Cream. Double Fudge Brownie Boat – A Brownie with Vanilla ice cream, Hot Fudge and Chocolate Whipped Cream. Vanilla, chocolate and strawberry ice cream, hot fudge, strawberries and pineapple topped with whipped cream, nuts and cherries. A smaller banana split with Vanilla and Chocolate ice cream, hot fudge and strawberries topped with whipped cream, nuts and cherries. Choose any ice cream flavor & a topping or two (listed below). We’ll add whipped cream, nuts & a cherry. You will have a delicious sundae! Hot Fudge, Strawberries, Heath Bar, Pineapple, Oreos, M&M’s, Peanut Butter Cups, Butterscotch, Chocolate Covered Almonds, Marshmallow, Peanuts, Coconut Sauce, Peanut Butter Sauce, Hot Apple. A Sundae Pak is a big bag full of all the goodies needed to make 8 great sundaes! 1/2 gallon of ice cream, hot fudge, strawberries, butterscotch, whipped cream, bananas, chopped nuts, cherries. 1/2 gallon of coffee ice cream, hot fudge, crushed Oreos, whipped cream, cherries. 1/2 gallon of ice cream, hot fudge, crushed Reese’s peanut butter cups, whipped cream, cherries. 1/2 gallon of ice cream, marshmallow, whipped cream, cherries. 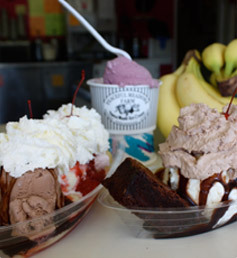 Choose two of the following: hot fudge, pineapple, strawberries, butterscotch or hot apple. Choose one of the following: chopped nuts, Heath Bars, Reese’s Peanut Butter Cups, crushed Oreos. All paks serve 8 and include dishes, spoons, napkins, and an ice cream scoop. No substitutions, please. Extra dishes, spoons, napkins, topping and whipped cream available. Ice Cream Cones – Available in regular or large. Coffee- we brew the coffee for what some say is our best flavor! Oreo- just what you’d expect! Coconut Chocolate Almond- the only monthly special we had to make a regular flavor! Coconut ice cream with chocolate covered almonds. Chocolate Chip Cookie Dough- kids love it! Vanilla Yogurt- In addition to vanilla, we offer another flavor that changes periodically. Want more variety? Try a Yogurt Blender! 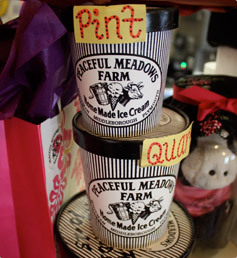 We offer hand packed ice cream by the 1/2 pint, pint, and quart. 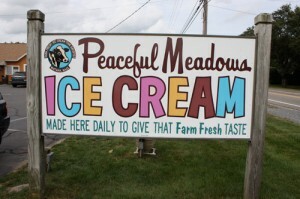 Half gallons of freezer pack ice cream are available. Enjoy your ice cream with topping, available by the 1/2 pint and pint.